Sometimes I try an experiment just so you don’t have to. Take Howard McGee’s riff on adding water to fine-tune the flavors of wines and spirits, for example. The California Wine Club is proud to share the flavors and the stories of the small family wineries handcrafting the hidden gems of wine country. Pick a bonus gift in your first club shipment! Browse the world’s ten best value wines on Wine-Searcher.com! Subscribe to The 30 Second Wine Advisor! Thanks to the miracles of social media optimization, McGee’s July 2010 Curious Cook article in The New York Times, “To Enhance Flavor, Just Add Water,” just popped up on my screen again. I may have missed it the first time around, but it definitely caught my attention eight years later. When McGee talks about food and drink, I listen. His magisterial, 895-page “On Food and Cooking: The Science and Lore of the Kitchen,” an encyclopedic but approachable guide to food science, has been on my bookshelf for years and gets lots of use. But this article made me wonder, when he declared that adding water — yes, water — to spirits, wine, even coffee, can make them taste better. I can see it with spirits, sort of, knowing that a splash of water in a glass of liquor can cut the alcoholic heat a bit and spread out the flavors on one’s palate. But watering wine or liquor on the sly has a long and unsavory history; the practice was known to lead to gunfights in Old West saloons. 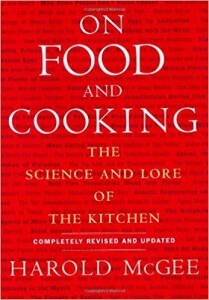 Buy Harold McGee’s “On Food and Cooking” from Amazon.com. Why, yes. Yes, we do. Or I do, anyway. You’ve seen me rant about this before, blaming a combination of warming climate and the taste buds of American critics for a gradual, continuing increase in the typical alcohol levels of wines, particularly reds. How can water reduce one sensation and amplify another? Both alcohol and aroma molecules are volatile, meaning they evaporate from foods and drinks and are carried by the air to the odor receptors high up in the nasal cavity. Aroma molecules are also more chemically similar to alcohol molecules than they are to water, so they tend to cling to alcohol, and are quicker to evaporate out of a drink when there’s less alcohol to cling to. This means that the more alcoholic a drink is, the more it cloisters its aroma molecules, and the less aroma it releases into the air. Add water and there’s less alcohol to irritate and burn, and more aroma release. Sounds good, doesn’t it? Of course I had to try it. 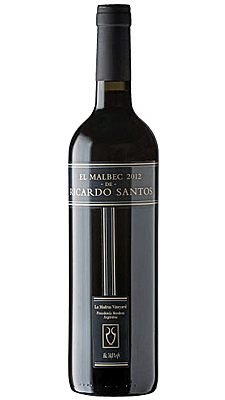 A quick trip to my neighborhood wine shop, The Wine Rack, unearthed a highly regarded single-vineyard Argentine Malbec, Ricardo Santos 2016 “El Malbec” La Madras Vineyard Mendoza Malbec, with “14%” printed in the usual tiny type on the label. Upon tasting, it lived up to the claim and then some. From its impression of alcoholic heat on the palate, I’d have guessed it exceeded the label claim by a good margin. To its credit, it tasted good, showing fresh plums and blackberries and intriguing minerally terroir. The alcoholic edge carried an almost liquorish burn, though, so it seemed like a good candidate for a splash of water. Alas, though it hurts me to push back against as lofty a figure as Harold McGee, it just didn’t work for me, not with this wine. A water dose amounting to one-fourth of the wine, as he recommended, just made the wine seem dilute. Sadly, even a smaller splash in another glass did not improve the wine; if anything, the result diluted the fruit more than the oak, making the wine unbalanced. I might try this again some day with another high-octane wine. Or not. How about you? Have you ever tried adding a little water to a high-alcohol wine? How did it work out? Let me know, with a post on our our WineLovers Discussion Group forum or on our WineLovers Facebook Page. Meanwhile, you’ll find my full tasting report on the (un-watered) Malbec below. We’re also talking about all the wines of South America in our WineLovers forum’s Wine Focus for July 2018: See you in South America!. Your comments, tasting reports and questions are welcome. 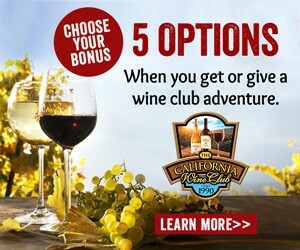 The California Wine Club is proud to share the flavors and the stories of the small family wineries handcrafting the hidden gems of wine country. We hand-select the best wines and deliver them to members across the U.S. Whether for yourself or as a gift, you can pick the bonus gift in the first club shipment. Plus, we’ll include a $25 wine credit and a VIP Tasting Invitation. Offer expires July 31, 2018. Bonus gifts available in first club membership shipments while supplies last. There are thousands of small family wineries handcrafting extraordinary wine in quantities too limited to be found in local stores or shops. In 1990 The California Wine Club Founders Bruce and Pam Boring discovered that these winemaking families were the most passionate in the wine world and that their wines were the hidden gems of wine country! Together Bruce and Pam embarked on a journey to help these artisan wineries introduce their exquisite wines to the world. Learn more. FOOD MATCH: It was excellent with leftover Ethiopian lamb (aromatically spiced but not fiery), and also worked well with meat loaf and gravy and, separately, with creamy cheese. WHEN TO DRINK: It’s good now with food, but the rough tannins, dark color and primary aromas suggest that a few years under good cellar conditions might see it evolve. I paid a couple of bucks more than Wine-Searcher.com’s $18 average retail, but the $20 range isn’t unreasonable for a quality single-vineyard Mendoza Malbec, if the high alcohol and oak style of New World reds suits your palate. Here’s a winery fact sheet on the Ricardo Santos “El Malbec,” 2013 vintage. The U.S. distributor’s website offers a bit more information. Search for vendors and compare prices for “El Malbec” de Ricardo Santos La Madras Vineyard Mendoza Malbec on Wine-Searcher.com. Want to browse more Argentine wines from Ricardo Santos Bodega y Vinedos? This Wine-Searcher.com page offers links to vendor information for all its wines. FOOD MATCH: Fine sipped by itself, and excellent with cheeses – ours was fine with thin slices of Parmigiano-Reggiano. It would also work very nicely with milder, white fish and less sweet seafood. WHEN TO DRINK: Young is best with most rosé, including this one. Drink up over the next year or two and then look for a more recent vintage. Now that rosé is finally taking its place among wines that justify a double-digit price tag, this fine bottle is well worth Wine-Searcher.com’s $17 average retail and my $17.99 local price. Importer Kermit Lynch is known for his detailed, informative fact sheets. Here’s the page for Delaille’s wines, including this rosé. 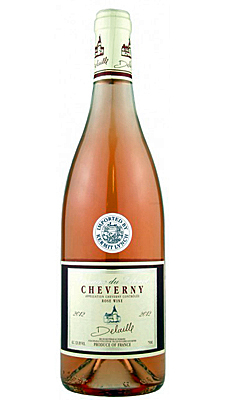 Check prices and compare vendors for Domaine du Salvard Cheverny Rosé on Wine-Searcher.com. Want tips to more good, inexpensive wines? Here are Wine-Searcher links to vendors and prices for a bunch more wines for $10 or less that I’ve told you about during the past few months. Please tell us about your favorites! If you have questions, comments or ideas to share about today’s article or wine in general, you’re always welcome to drop by our online WineLovers Discussion Group, the Internet’s first and most civil online community. Discussions are open for public viewing, but you must register to post. If you’re a Facebook user, you can join our forum with a single click! All you need to do is visit the forum and click “Social Login” at upper right. We’d also be delighted to have you visit and “Like” our WineLovers Facebook Page. This way you can get Facebook notifications when there’s a new The 30 Second Wine Advisor issue or a topic of particular interest on the WineLovers Discussion Group (WLDG). The quickest and easiest way to change your email address is simply to unsubscribe from your old address and register again from the new one: Subscribe to The 30 Second Wine Advisor (free). Read nearly 20 years of past articles in the Wine Advisor Archives.